The Queen musical We Will Rock You is to close at the Dominion Theatre after 12 years. This leaves a very real and pressing question: what's to be done with the landmark Freddie Mercury statue, which towers over the theatre entrance? We asked our readers for ideas via Twitter and Facebook. 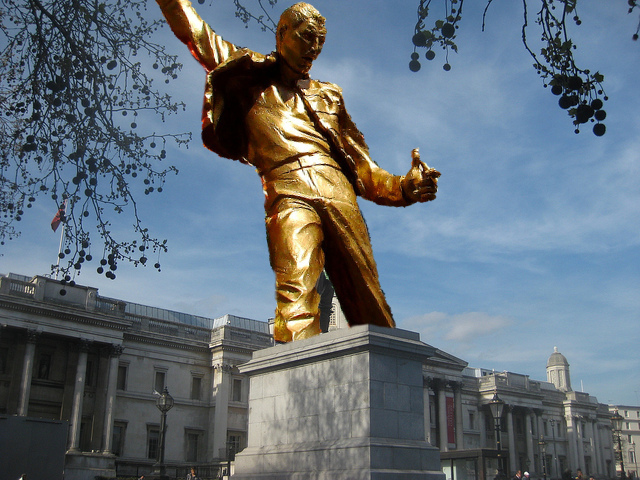 The commonest suggestion would see the golden rocker permanently adorn Trafalgar Square's empty plinth. It would also serve as an excellent way to wind up National Gallery Director Nicholas Penny. Some commenters — with a creative sense of proportion — even suggested that Mercury should supplant Nelson on top of the Square's famous column. Another common, and very sensible, suggestion is to sell the mighty Freddie to the highest bidder and donate the proceeds to an AIDS charity. Several readers suggested that the statue be employed for some kind of idolatry or pagan worship. @railtonrailton thought that a Wicker Man burning ritual might be in order. Reader @JamesBadcock reckons "there must be somewhere to place it within the new Tottenham Court Road station development". Indeed, Crossrail, which will stop here from 2018, is spending heavily on public art for its stations. What better way to retain a piece of local history and brighten up the atrium? A larger-than-life figure with a talent for performance. A man who would regularly declare "I want to ride my bicycle". A history of being Under Pressure. Freddie Mercury seems to have many of the attributes of our current Mayor, so why not install his golden simulacrum in City Hall? That was the suggestion of reader @CulturalSnow. @Relishresearch was the first of several readers to suggest gifting the statue to Fulham FC. The club has little if any connection to the singer, but that didn't stop them erecting a plastic likeness of Michael Jackson a few years back. The King of Pop has now been evicted and given back to the club's former owner, Mohammed Al Fayed. Perhaps the eccentric millionaire could take Freddie under his wing, too, and start a sculpture garden of dead singers. The Monument to the Great Fire in the City of London is an oft-overlooked landmark. 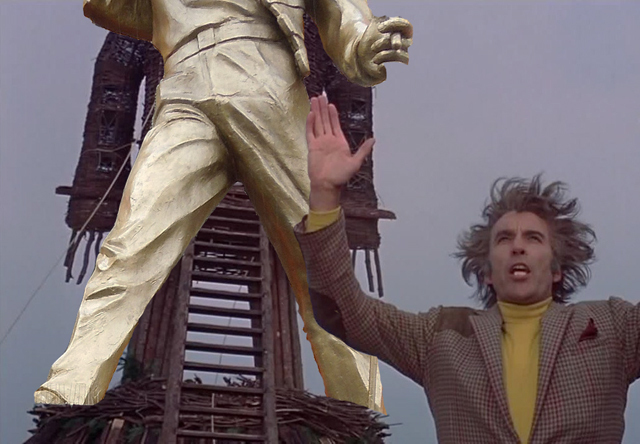 The @londonmonument account suggests "Swap it for my golden flame...Freddie would look pretty awesome on top of the Monument". Well, Queen did have a song called Put Out The Fire. Perhaps the most bizarre suggestion comes from Liz Macfadyen on Facebook. While we quite like the idea of the oversized Mercury pinned to the middle of the London Eye, endlessly rotating above the water, that's more Duran Duran's style. Facebook user Jim Copley reckons Freddie should finally 'break free' of Earth's atmosphere to become the centrepiece of the ISS. He does have an astral name, after all. 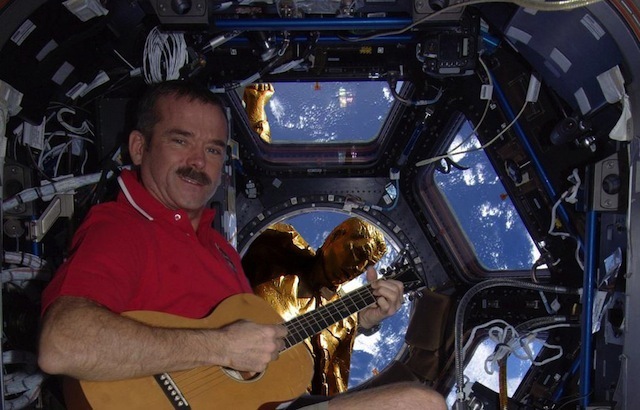 Perhaps he could duet with fellow moustachioed star, Commander Chris Hadfield? Reader @DavidSim suggests that the statue has become part of the urban landscape and should be left in place. Amen to that one. "I would take it and I would melt it down into currency and spend every penny campaigning to remove Queen music from every home, outlet and cloud in existence." Susan Schultz via Facebook. In addition, several readers thought our shining hero should be re-erected in Feltham, where Mercury and his family lived in the 1960s. Other locations include Wembley, Brighton, Camden and Hyde Park. Freddie cut-out borrowed from O.F.E. in the Londonist Flickr pool. Dodgy photoshopping all our own work.